Once you know you have an heirloom variety, the next step is to harvest the seeds. It's best to wait for the tomato to fully mature before you remove it from the vine. If possible, wait an extra day or two until the fruit softens just a bit, to the point where it's almost over-ripe. The reason for this is that you want the seeds to be fully developed and mature. 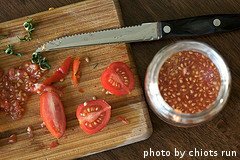 Once you have a fully ripe heirloom tomato, slice it half, scoop out the seeds and pulp and put them into a jar. Then, you need to ferment the seeds, which will kill any disease organisms that are present. Using this fermentation step when saving tomato seeds will also get rid of the slippery gel that surrounds the seeds. If you don't get rid of this protective coat, the seeds will have a hard time germinating when you go to plant them. To ferment the seeds, fill any size jar halfway with the seeds and pulp you scooped out the tomato. Add about half as much water as there are seeds and pulp. For example, if you fill half a pint-sized jar with seeds/pulp, add about 1/2 cup of water. Close the jar and store in a warm place (75-80 degrees F) for 4-5 days. Check the jar a couple of times a day - you want to see gas bubbles and/or white mold on the surface of the liquid. Once you see this, allow the seeds to ferment for another day. Then it's time to clean and dry the seeds. Once the seeds have been fermented, pour the contents of the jar into a strainer to remove as much liquid as possible. Then remove some of the pulp from the seeds by hand. Rinse out the fermentation jar thoroughly as you can re-use it separate the seeds. Add the seeds to the rinsed jar and then fill it up with water. The healthy, viable seeds will sink to the bottom and the pulp and dead seeds will float to the top. Use a slotted spoon to skim off the pulp and non-viable seeds. Then you can drain the viable seeds on a paper towel, just to get most of the excess moisture off. Your saved tomato seeds are now ready for drying. 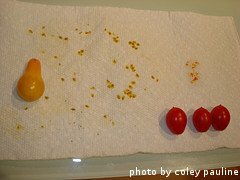 The next step in saving tomato seeds is to dry them out a bit. There's a couple of ways you can do this. We've found the easiest way is in a conventional oven. First, spread the seeds in a single layer on a baking sheet or piece of foil. Place the baking sheet on the middle rack of your oven, close the door and turn on the oven light. DO NOT TURN ON THE OVEN. The ambient heat from the light is enough to dry out the seeds in about 36-48 hours. When they are dried enough, the seeds will be harder, more brittle and they'll have shrunk a little bit. You can then put the seeds inside an envelope and store them in a jar in your refrigerator. Make sure you label the envelope so you know what seeds it contains. If you are saving lots of different seeds, several envelopes can fit inside one, quart-sized jar. It's also a good idea to put a tablespoon of dry rice at the bottom of the jar just to absorb any moisture. You can also save tomato seeds by using a food dehydrator. Spread the seeds out in a single layer on the dehydrator tray. Depending on the model, you may need to put the seeds on foil so they don't fall through the trays. Drying times vary depending on the dehydrator model, but the seeds are usually dry enough in a day or two. The key is to use the lowest available setting and keep the seeds as far away from the heat source as possible. A third option for saving tomato seeds is just letting them air dry. Spread them in a single layer on a baking sheet or foil and put them in a dry place, preferably away from the humidity of a kitchen. In most cases, the seeds will dry out enough in a few days. Again, you want them to harden up and shrink a little bit. 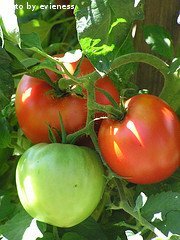 Click on the following links to learn more about growing tomatoes.